Most people misunderstand how Payroll updates FI/CO? First, we’ll release the payroll: This sets a system parameter that allows the payroll to be run. In this step you select the payroll area and payroll dates you are processing. Next, we’ll select “Start payroll”, enter screen parameters and launch the payroll process: This will generate wage types and assign cost centers. We’ll check the results by viewing the Remuneration statement. Finally, we’ll select the “Exit payroll” step: This sets payroll process system parameter to “finalized”, so additional processing may be completed. Payroll uses the A/P Payment Program for the ACH and check printing processes. The check register will be updated. In contrast to A/P payments, the G/L (FI/CO) will not be updated. After doing this, your check register will be out of balance with your outgoing payments G/L account in FI/CO. FI/CO will also be out of balance with Payroll because no expense or liability postings will have been transferred yet. How to Generate the DME? The check register has been updated and reflects the newly printed payroll checks, but FI/CO has no payroll information! You can run payroll and generate checks without transferring to FI/CO. In other words: you can successfully run the payroll, cut the payroll checks, and distribute them to employees without updating FI/CO at all! To solve this Payroll-FI/CO discrepancy, we’ll “manually” execute transaction PCP0. This is an important, separate step after generating payroll and cutting checks (DME). It uses the employee’s home cost center to determine the cost center to post to. It uses the mapping of wage types to symbolic accounts to G/L accounts to determine the correct G/L account/cost element to use. I'll explain these elements and relationships in detail later. Note: When viewing the FI/CO update document, use menu path Extras>Original Document to jump to the payroll Remuneration statement (which lists the wage types/employees that make up the FI/CO posting). Employee withholdings such as garnishments can NOT be passed to the A/P vendor if the third-party Remittance Posting Run is not executed. In this step the Integration Is Automatic. Once you post your third-party Remittances, the proper A/P vendors accounts are updated so that you can process them like any other liability through the A/P payment program. CATS is a great tool to use when you have hourly employees, especially when these employees can do work over several projects or cost-centers. CATS even allows you to “charge” the worked cost-centers for different activity rates depending on the type of work/project the employee is working on. CATS allows you to spread costs over the cost-centers actually worked, instead of the employee’s home cost-center which is the SAP default when posting from Payroll to FI/CO. 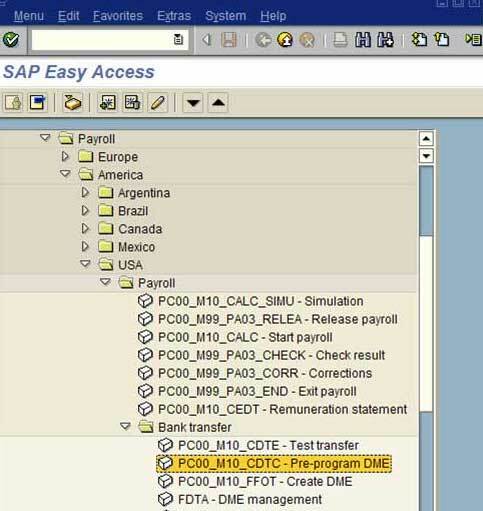 As was shown in the previous section, Payroll uses the A/P payment program to generate checks and ACH payments (DME). You use the same configuration techniques that you use for A/P. Note: There are no debits and credits in the bizzaro world of Payroll. Use a + like a debit and a – like a credit. Know how each wage type relates to financial transactions: Make sure your payroll and FI/CO teams communicate. When in doubt create a new symbolic account: Sometimes the intended use of the wage type is not completely understood or may change over time. Often, when it comes time to change how the wage type is posting in the G/L, people will take a short cut and change the mapping of the symbolic account that is assigned to that wage type. If that symbolic account is assigned to other wage types that are posting correctly, you can break more than you are fixing. Be careful about changing the mapping. Make sure that the symbolic account you want to change isn’t assigned to another wage type that needs to post where the symbolic account is currently set to post! I described a “third-party remittances” feature earlier. During payroll you can also accrue liabilities for and pay. Garnishment Processors and the other types of vendors are posted to AP during the third-party Remittance process. The key integration point is mapping/linking the HR payee to an A/P Vendor account. As was shown earlier there is no “automatic” integration link between Payroll and FI/CO: The integration between the two is manual and somewhat “forced”. Step 1: Map net payroll results (outgoing cash) to your bank clearing account or another clearing account. This is done when you map symbolic accounts to G/L accounts. Step 2: Manually journal from the clearing account to the bank clearing account. Done via a manual journal entry, either FB01 or FB50. It’s cumbersome:Especially for corporations that use one company code to make payments for other company codes. SAP Has Released a Solution! Note: If you run RFPYHR00 after creating the DME but before you print the DME your payroll checks in the check register won’t be linked to an Warning accounting document.